In case you have this demand, maybe the first string striking you is to open Google and search for "free MKV to MPEG converter for Mac". Possibly, you would get a great deal of information. However, how much is of value? Who knows? Generally, the truth is that the majority of users would beef about the programs they find, for those tools would be broken down half-way during the MKV conversion process, or just be the free trial version with several restrictions. Consequently, the old saying, "What price, what goods", once again get Mac users' recognition. Probably scores of users are losing confidence and trust to the free converters. Don't be! Although there do exist certain free tools that are power-free to smoothly convert MKV file, this doesn't mean there is no more solid enough tool. To prove this, here comes a reliable and 100% free tool - macXvideo to aid you to freely yet worry-free convert MKV to MPEG on Mac with better output quality. macXvideo - free convert MKV to MP4, MOV, MPEG, etc with high quality, Bit rate doubled! Thus, you can get a MPEG file with higher in quality and also larger in size (2.5 times). You can apply video editing features (trim/crop) to properly downsize file size to balance between quality and file size. 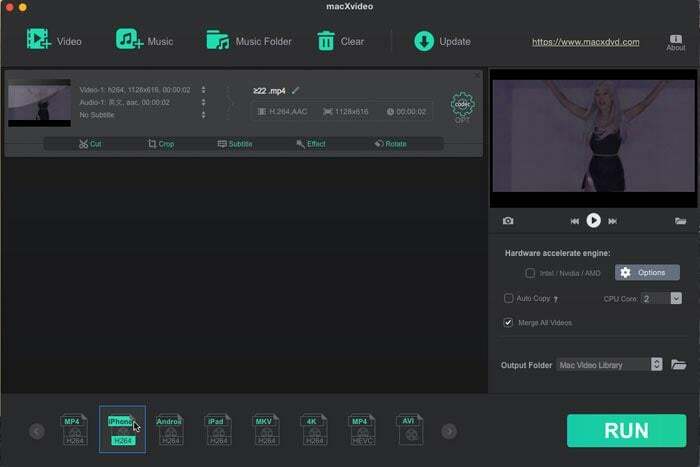 macXvideo is regarded as a free yet mighty MKV to MPEG converter to free convert MKV to mainstream video format with higher quality than the original file due to the video codec change, along with High Quality Engine and Auto Copy aids. We convert a 74.4 MB MKV file with 2174 kbps to MPEG. And the output MPEG file doubts in the bit rate, up to 4693 kbps and also the file size becomes 2.5 times larger than before. Have to admit that the MPEG file quality is extremely outstanding! Well, if you encounter the failure when you try to import the large-sized MPEG to your mobile devices, you can utilize this video converter editing features to compress video like remove unwanted parts from video, cut off the black border to control the image size, etc. These tips are useful. You can have a try. Step 1: Import MKV File You Want to Convert. Free download this video converter and fire it up on Mac OS X. Then click the "Add File" button to load the MKV files. Select the target format - MP4 in MPEG codec at the bottom of the interface. This gratis MKV video converter for Mac also enables you to customize your output video by trimming, clipping, adding external subtitles or extract favorite MP3 video from video. Click the Folder button to choose the path where you want to save the output files in. Click the "RUN" button to start to convert MKV to MPEG on your Mac computer for free. Then let the program do the rest for you. Free Convert MKV to MPEG on Mac with Much Higher Quality, Bit Rate Doubled!